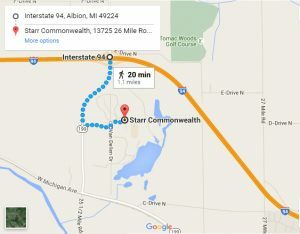 A teenager who had run away from Starr Commonwealth died Friday when he was struck by a van on I-94. 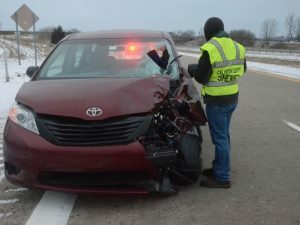 The driver of the van, a man, 49, from Auburn, Ind., was taken to Oaklawn Hospital in Marshall for treatment, but deputies said he had only minor injuries. 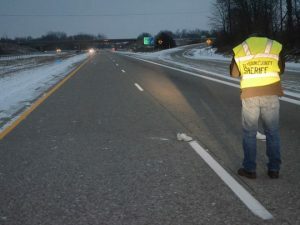 Lincoln said it appears the student left the campus at 13725 26-Mile Road, a half mile away, and walked down the exit ramp from eastbound I-94 to 26-Mile Road. He then crossed the two eastbound lanes and walked west along the median before crossing the same eastbound lanes and being struck by the eastbound van. The impact on the driver’s side front heavily damaged the van. The driver told deputies he coasted to a stop about a quarter mile from the impact. The body of the teen was thrown to the north side of the highway. His shoes remained in the center of the roadway. Deputies said they are unsure if the teen was trying to stop a vehicle for a ride or intentionally ran into the path of the van. Investigators do not believe speed or alcohol were factors in the crash, which remains under investigation by the department’s Accident Reconstruction Team. The eastbound lanes were closed between 22 1/2 Mile Road and 26-Mile Road until about 9 a.m.